What's the purpose of the the big pipe you can see being attached to it, is it cooling something onboard? Thanks, hence the guys in the environmental suits. I see yet again people have been saying it has been carrying out reconnaissance, I don't believe this I think it's doing what they say they it's doing that's materials & technology testing & validation through long term exposure to space. I think you were right the first time: I think it's for cooling. It seems too thick for handling prop. It looks more like an air con hose. Cooling would come first and prop offload later. The environmental suits would be needed for approaching the vehicle anyway. VANDENBERG AIR FORCE BASE, Calif., Oct. 17, 2014 – The Boeing [NYSE: BA]-built X-37B Orbital Test Vehicle (OTV) successfully de-orbited and landed today at Vandenberg Air Force Base at 9:24 a.m. PDT, concluding a 674-day experimental test mission for the U.S. Air Force Rapid Capabilities Office. The X-37B was launched from Cape Canaveral Air Force Station, Fla., on Dec. 11, 2012. The first OTV mission began April 22, 2010, and concluded on Dec. 3, 2010, after 224 days in orbit. The second OTV mission began March 5, 2011, and concluded on June 16, 2012, after 468 days on orbit. The X-37B program is demonstrating a reliable, reusable unmanned space test platform for the Air Force. Its objectives include space experimentation, risk reduction and concept-of-operations development for reusable space vehicle technologies that could become key enablers for future space missions. Boeing's commitment to this space-based unmanned vehicle spans a decade and includes support to the Air Force Research Lab's X-40 program, NASA's X-37 program and the Defense Advanced Research Projects Agency's X-37 Approach & Landing Test Vehicle program. Helodriver, Is the noise hearable in the footage coming from a chase plane or it is just her real noise ? It is for cooling the vehicle. The avionics may be still running and there is soak back from the entry heat. The radiators are stowed, so there has to be a way to remove the heat. The same connection is used while the vehicle is in the fairing at the pad. Standard spacecraft have surfaces/radiators exposed to fairing air during prelaunch. There has to be a way to remove the internal heat from entry vehicles that are clad in TPS. They won't be deservicing the vehicle on the runway. The suit are just to protect the workers from residual fumes and any leaks. Note to those who think space stations need large pressurized bays to service spacecraft. If you still have to wear a suit to approach a spacecraft, might as well just do as an EVA. Does anyone else find the shape of the flaperon interesting? What would be the purpose of the apparent twist? Prevent tip stall (i.e. washout)? Keep tip heating down during entry? That's interesting. Washout or washin on aircraft is usually done on the leading edge. However, the LE shape is constrained by entry heating, so for a hypersonic vehicle it would have to be done on the TE. What Jim said. That airflow sound was audible about 10 seconds before the vehicle could be spotted flaring over the runway lights. The vehicle is so small that it was hard to pick out before it was very low. The sound was the only clue. Blink and you'd miss it. I noticed something interesting when examining the OTV-3 landing photos which might give some clues about its on-orbit behavior. There is a notable amount of discoloration on the top side of the vehicle. At first I assumed this was related to entry heating, but then I noticed that it is only present on the payload bay doors. It is most prominent at the front of the doors, and totally absent just forward of them. This makes the reentry heating hypothesis unlikely, as it fails to explain that sharp boundary. I think the most logical conclusion is that it is caused by prolonged sun exposure, indicating that OTV-3 had its bottom side continually facing the sun for the vast majority of its mission (to protect sensitive optics or other equipment from sun exposure perhaps). The boundary between the discolored area and the clean area matches very well where the shadow of the wing would be while the doors were open and the bottom side was facing the sun. I created a very approximate model of the vehicle to illustrate the concept (see attached). You can see which parts of the payload bay doors are sunlit, and which parts are in shadow. It seems to correspond well with the difference in coloration on the doors. EDIT: Realized after posting this that the spacecraft's orientation relative to the sun would not significantly affect which parts of the payload bay doors were suntanned. Given their close proximity to the wings, some places will be in shadow regardless of sun angle. So my previous statement about the bottom strictly facing towards the sun the whole time is not warranted. It's much more likely that the top was pointed towards Earth, or specific locations on it, without regard to sun angle. Still, it's cool to observe this effect. "I much prefer the sharpest criticism of a single intelligent man to the thoughtless approval of the masses." HarbingerDawn, good observation and seems a likely cause. The flat aft end appears a bit sun scorched relative to past photos as well but as Ed remarked a couple pages back, the fact that all systems worked well after two years in orbit is very impressive. I can't help but imagine the cool video if X-37B had a couple stabilizer cameras, maybe displayed on split screen. Columbia's was pretty big but probably offered more protection. Edit: oops, shuttle camera mount was fixed. The landing video is quite interesting, especially the view from the approach end down the runway: It looks like main gear touchdown was about one wingspan away to the right of the runway centerline, which is about 14 ft. After main gear touchdown the vehicle is correcting the offset by moving to the left to reach the centerline. Nose gear touchdown is just before reaching the centerline, and the airbrake seems to be deployed after nose gear touchdown, about the time when the centerline is reached. But then the vehicle overshoots the centerline a bit to the left and just before the video ends you can see that the vehicle is moving to the right again. Do we know, if there was any crosswind? What is the nominal speed at touchdown? This June 16, 2012 file image from video made available by the Vandenberg Air Force Base shows an infrared view of the X-37B unmanned spacecraft landing at Vandenberg Air Force Base. Regarding the discoloration on the payload bay doors: I think we're seeing a difference in thermal protection. There are the thermal protection blankets that cover heated areas that don't require tiles, then there's a white area just ahead of the doors that appears to have some sort of white protection (painted on? ), and then there's the door's themselves which show a bit of charring (less or different type of paint?). Anybody got any other ideas? Winds at the surface were negligible. Not sure what the winds a few hundred feet were, but its unlikely they were strong enough to carry the vehicle off course too far given the very high sink rate. I can't see any obvious difference in the materials used; the top of the doors seem to be the same white material as the rest of the top of the vehicle, and the sides seem to use the same thermal blankets as the rest too, so I see no reason to think that there's some unseen difference there, though it is possible. The color of the affected area matches what would be expected from sun exposure, as does the pattern of the discoloration, so that still strikes me as the most likely cause. Could the solar panels it uses be part of the technology it's developing, there's nothing to say it's using the same panels on each flight. 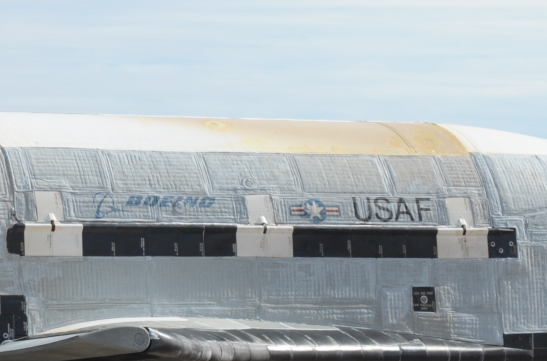 Probably is just space weathering (sun tan) but I am also wondering about the thermal effects on the s/c skin, if any, of the operation of the radiators (open payload bay) on a 675 day mission. Cumulatively that's a lot of heat to get rid of. Just a guess.